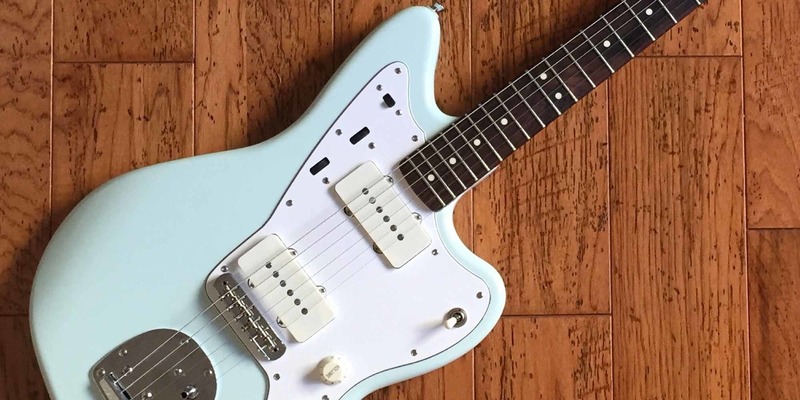 In the first part of this series, we discussed ways to upgrade a stock Squier Vintage Modified Jazzmaster. Here we’ll lay out some wiring mods that can give your offset more versatility and even put the rhythm circuit to good use. All parts for this mod are listed and available as the Rothstein Guitars Jazzmaster STB Super Mod DIY Upgrade Kit. 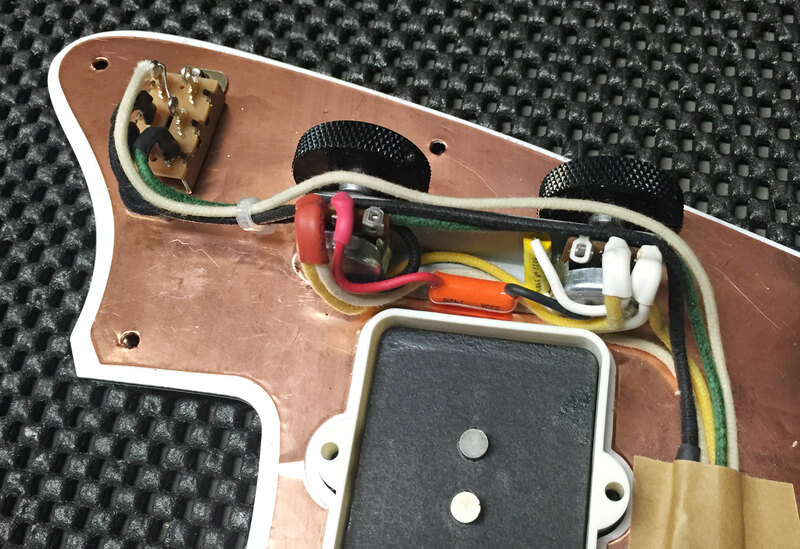 One mod reconfigures the lead circuit to make the guitar more like a Les Paul by employing two independent volume controls, one for each pickup. That way, players can blend a percentage of neck pickup with the bridge pickup – or vice versa. I would recommend sticking with the stock value of 1 meg pots. Below is a diagram showing how to wire the lead circuit with dual volume controls. Jazzmaster lead circuit with dual volume controls. Click to view full size. Next we’ll examine how to modify the rhythm circuit. Some continue the Les Paul wiring approach by assigning an independent tone control to each of the two independent volume knobs. However, a really cool and useful alternative borrows the passive treble bass tone stack (PTB) Leo Fender developed for G&L Guitars. One control cuts treble and the other cuts bass. Both are configured as “master” controls, meaning they affect all pickup switch positions. The treble cut control, which is a low-pass filter, functions like a standard tone control. A low-pass filter allows frequencies lower than the cutoff frequency to pass, and higher frequencies are rolled off. The cutoff frequency is controlled by the capacitor and resistor values. The bass cut control is another animal entirely. It’s a high-pass filter, which is the opposite of a low-pass filter. A high-pass filter allows frequencies higher than the cutoff frequency to pass, and lower frequencies are rolled off. The ability to dial out some of the low frequencies is useful, particularly to help overdriven sounds “pop” and cut through a mix. I like to think of it as a “sharpen” control. What does it sound like? Check out the following three sound samples. 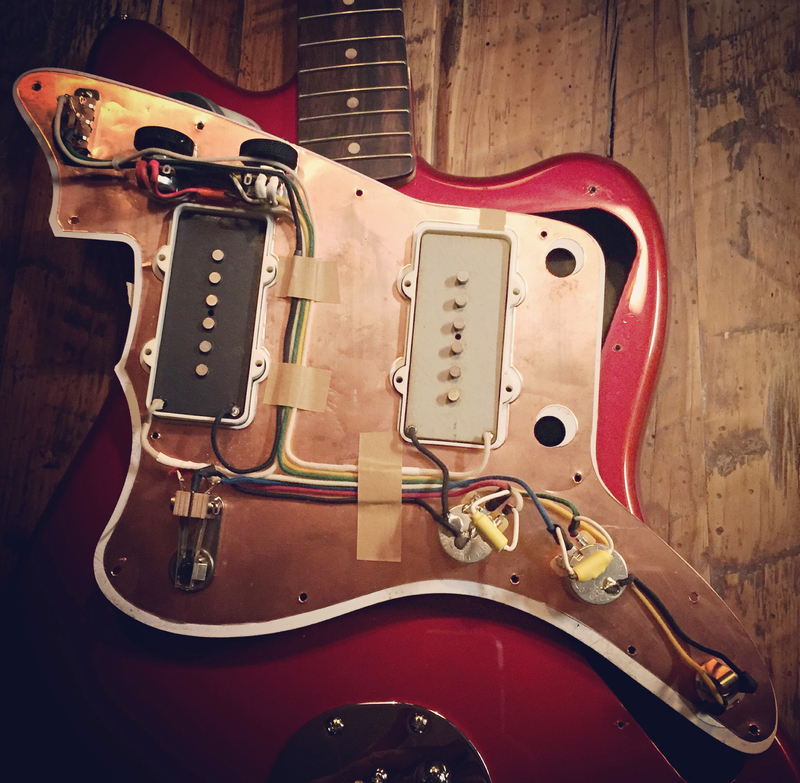 I performed all of them with a Squier Vintage Modified Jazzmaster with electronics upgraded using the mods described here and Curtis Novak pickups (JM-FAT bridge and JM-V neck). The samples were recorded by mic’ing a Rebel 30 amp using the amp’s overdrive channel. I didn’t use pedals or audio plug-ins. In the first sample, both controls are rotated fully clockwise on 10, and therefore disengaged. In the second sample, the bass cut pot has been rolled down to the 2-3 range, so you hear a somewhat sharper sound provided by the bass cut. In the third sample, both pots have been rotated almost fully counterclockwise. It’s an unusual effect that emphasizes the lower mid-range. Component selection is important for the bass cut control. 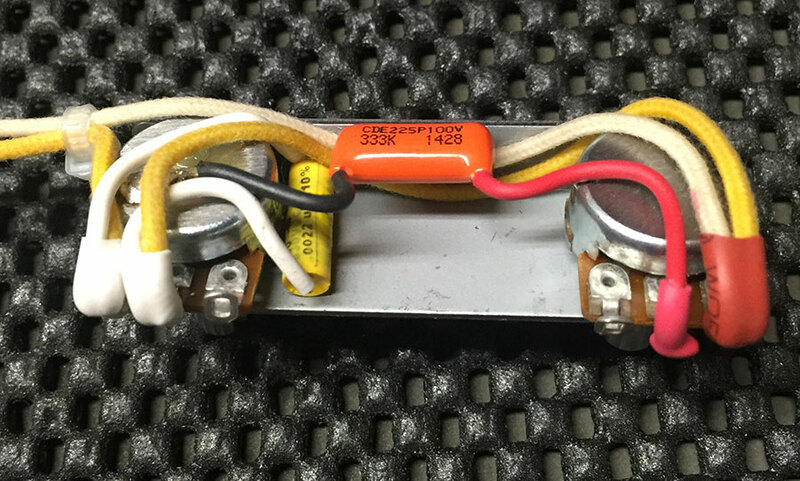 Leo Fender’s design calls for a 1 meg reverse taper pot with a .002 MFD capacitor. You can experiment with the capacitor value in the range of .001 MFD to .003 MFD. The smaller the capacitor value, the more pronounced the bass cut. For example, a .001 MFD capacitor provides a more dramatic bass cut, and a .003 MFD is more subtle. For the pot value, stick with 1 meg, and the reverse taper is critical for the pot to provide a gradual bass roll-off. There’s plenty of flexibility with component selection for the treble-cut control, but I prefer to stick with the standard values used on the primary tone pot in vintage Jazzmaster wiring, namely a 1 meg audio taper pot with a .033 MFD capacitor. 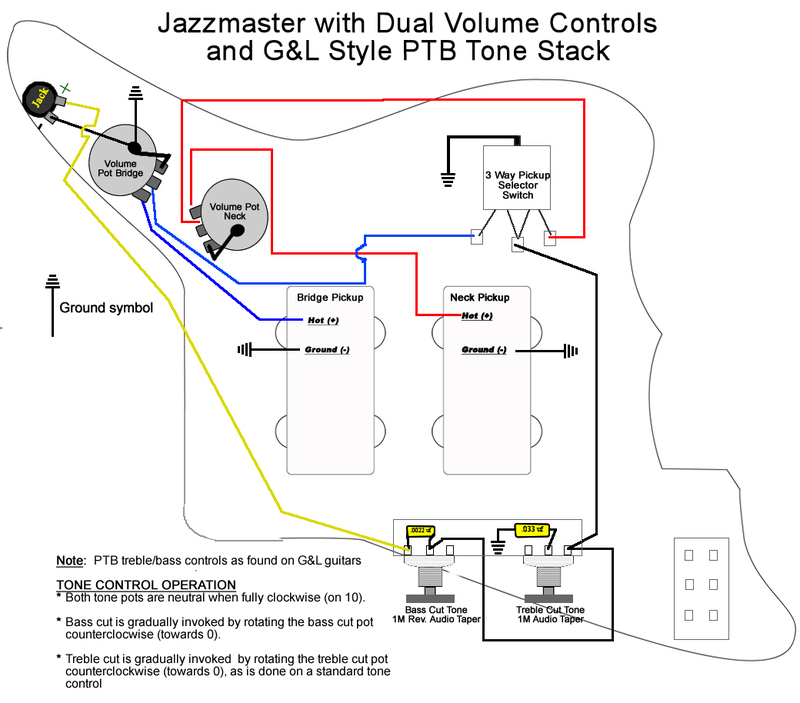 The diagram below shows how to incorporate the PTB tone stack into the initial diagram. Note that with the treble cut control, the capacitor is directed to ground, whereas with the bass cut control the capacitor is in line with the signal. Jazzmaster lead circuit w/dual volume controls and G&L style PTB tone stack. Click to view full size. The photo includes a closeup of the bass and treble tone controls. Note the liberal use of heat shrink tubing to prevent ground-outs during installation. A useful mod for the slide switch is series/parallel switching. 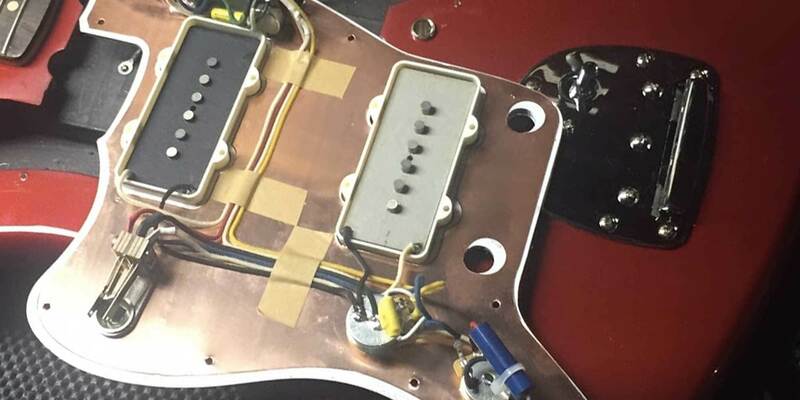 In traditional Jazzmaster wiring, when the two pickups are combined via the toggle switch, they are in parallel. Rewiring the slide switch can engage a series connection, which yields a significantly different sound. Series will sound more humbucker-like, with louder, darker and more-pronounced mids. In contrast, the parallel will sound brighter, with scooped mids and exhibiting more “quack” and twang. I demonstrate that in the following sound sample where I play the same pattern, first in parallel and then in series. Putting it all together, the wiring diagram below combines all three mods: dual volume controls, a PTB tone stack and series/parallel switching. Jazzmaster lead circuit with dual volume controls, G&L style PTB tone stack and DPDT series/parallel switch. There’s a closeup of the completed rhythm circuit, followed by the final wiring harness, ready for mounting on a guitar. This wiring scheme produces an unexpected byproduct. When the series connection is engaged, the toggle-switch in the bridge position yields no sound at all. To some, it’s a “happy accident” that provides a kill switch effect as an added bonus. Others dislike having a dead toggle switch position when in series mode. For the latter group, here’s an easy fix. You’ll need an extra pole on the slide switch. Each set of solder lugs is referred to as a pole. 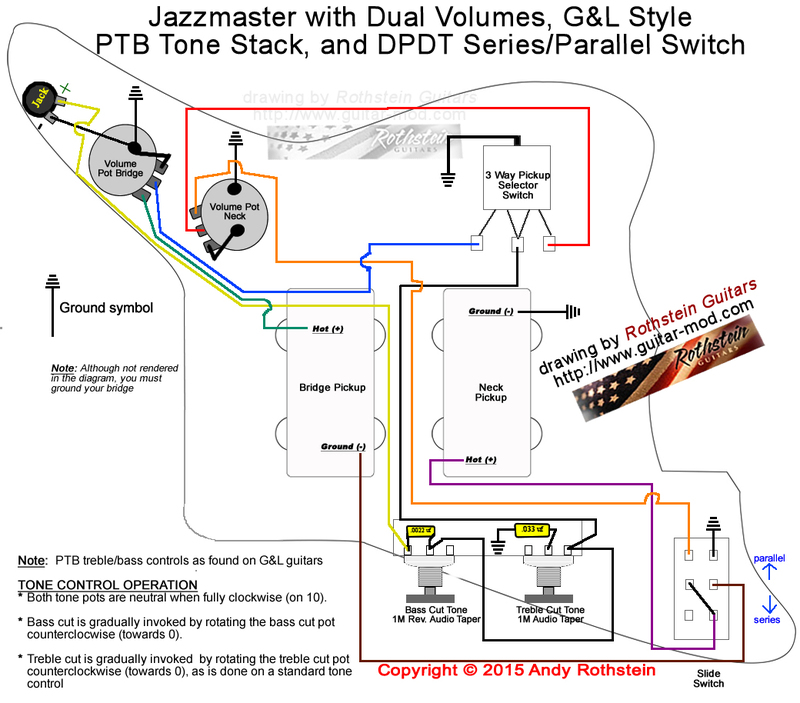 The traditional Jazzmaster slide switch is a double-pole double-throw (DPDT) switch, and therefore has two poles. You need a three-pole double-throw switch (3PDT), which is available from mouser electronics (Swithcraft brand, part #50209LX). Observe the following diagram depicting the extra third pole on the slide switch. Jazzmaster lead circuit with dual volume controls, G&L style PTB tone stack and 3PDT series/parallel switch. And there you have it. The right mods can solve the enigma of the Jazzmaster rhythm circuit. Lots of players have a hankering for a Jazzmaster these days, and a limited budget shouldn’t stand in the way. Why not buy a low- or medium-priced model and upgrade it with new pickups and wiring? Andy Rothstein has been a guitarist for 35 years. He owns and operates Rothstein Guitars, which specializes in guitar wiring. He has recorded two solo Jazz Fusion albums, Wit of the Staircase and Voodoo Tone.